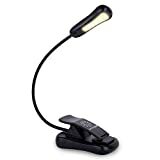 There are so many options available to you when it comes to corded book lights and rechargeable book lights. Selecting one requires that you have a general knowledge of features, brightness, and battery life. Taking this into consideration, we’re focusing on providing you with the best rechargeable book light options of this year. This makes your search for the top book light easier, and you won’t have to spend hours wasting time on finding a book light that works well. In this article, we will cover five different rechargeable models of book lights that you can use at night. The LuminoLite Book Light has been designed to provide you with quick charging on the go because the manufacturer understands that it’s a bummer to run out of light while you’re reading. There are many other book lights on the market, which makes it hard to pick one but the fact that the LuminoLite has a safelight feature which, ensures that your eyes won’t be damaged or disturbed at the odd hours of the night made it easy for us to include it on this list. As an added convenience, there is a clip that you can use to attach it to a table, your book, or a headboard. Lastly, the book light is lightweight, which means it's easy to carry around. The LuminoLite Book Light is built with a rechargeable 1000AH Li-ion battery that can provide you with up to 60 hours of light. There are three different power modes which you can use to charge the device. Use either USB ports, the power bank, or a 5V phone charger. The whole unit only weighs 2.15 ounces and can easily clip onto any reading surface or the book itself. Since this device is built to be small, it conveniently puts out enough light, but just enough to light what you’re reading. That means you won’t be bothering the person sleeping next to you. The light is a soft diffused light which is easy on the eyes and can light up to two pages of text. The reading lamp also includes an infinitely flexible and bendable neck for your convenience. 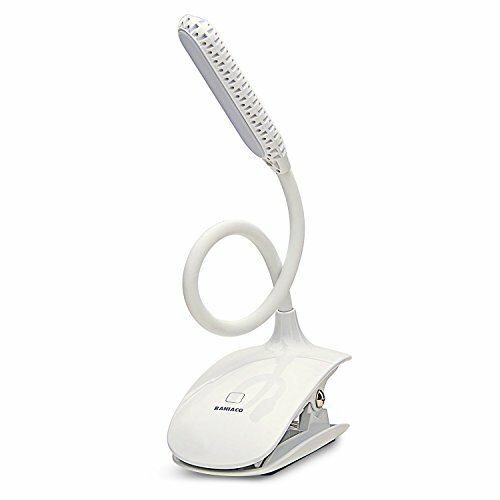 The Raniaco Reading Light is a compact product which has been designed to be USB chargeable and is ideal for bedside use. The device comes in a unique modern white design which looks stunning on any desk or nightstand. 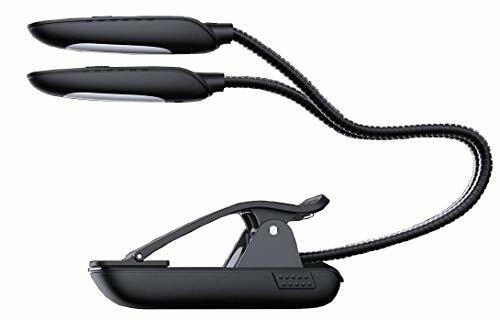 The reading lamp comes with long-lasting battery life and has an extra-long neck which can be useful in situations where you need to twist and adjust the neck to fit your book comfortably. The touch switch has an adjustable brightness that can be changed to three different settings. The first setting is ideal for use in bed, while the medium level can be used in any situation, and the brightest level is perfect for reading and studying. Rechargeable batteries usually don’t last long, but with the light's 1,000 mAH battery that can be charged through USB, you’ll be provided with 24 hours of battery life if used on the lowest setting. Twelve LED bulbs line the lamp and the soft light produced protects your eyes and can help you settle down for the night. Additionally, the neck of the reading lamp has a unique twisted tube design which can be adjusted and rotated up to 360 degrees. Included in the clamp is an anti-slip silicone pad which makes the body sturdy and secure. 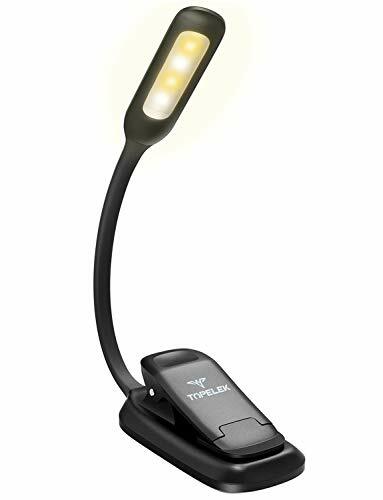 The TopElek Reading Light has been designed with adjustable brightness settings which can be used to change it to your reading conditions. The flexible gooseneck is also useful because you’ll find yourself needing to change the light position depending on where you are reading on the page. To protect your eyes, there is a non-flicker protection system which keeps the light from having any blackouts. The last feature that makes this device stand out is the highly durable and long-lasting lithium battery, which ensures that this product can be used all night long. The flexible gooseneck with a silicone cover can be adjusted up to 360 degrees, ensuring you’ll be able to use it in any reading conditions, while the silicone surface protects the pages of the book from having a clamp mark or getting damaged. The non-flicker light and eye protection systems work by preventing flickers and enhancing natural light, which can help protect your eyes. The rechargeable lithium battery is built to be strong and durable, and it lasts up to 12 hours with every charge. The Ousum Book Light has been designed to clip onto your book and can be used to read at night. The portable clip book has a unique light which is similar to a desk light, and this will provide you with enough light to read, but also provide you with a low enough glow not to disturb your sleeping partner. The reading lamp has been designed with your eye safety in mind as well. It includes eye care brightness technology, which is perfect for those who want to prevent eye damage or strain. 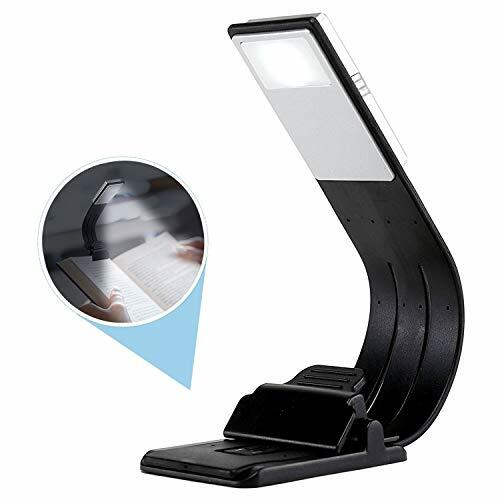 Many other booklights can put a strain on your eyes and cause you to get a headache, but this book lamp has a stable and reliable warm LED light. The device can be powered conveniently by USB, which means you can plug it into your PC, USB adapter, or even into a convertible car-charging device. Charging times vary depending on how much of the battery you use, but the device can get fully charged in a little as 30 minutes. The battery life can last up to eight hours if used on the lowest setting. The whole clip-on unit is lightweight and is made to be thin and compact. In fact, the design makes it almost non-existent while still providing you with enough lighting to read. The LED light can also be comfortably folded into a bookmark when you don’t want to use it. The Book Light Enhanced has been designed to have long battery life and has three types of light ranging from warm, to natural, to cold, each with 3 levels of brightness. The lamp is specifically designed to clip almost anywhere, from the back of a book to headboards. The variety of light types and intensities make this lamp a true all rounder, capable of providing reading light in most situations. The unit is designed to be lightweight, specifically weighing a total of 2.2 to 2.9 ounces, depending on the model. It is also equipped with a rotating gooseneck that makes it easy to adjust to every direction. The rechargeable 1,200 Mah lithium battery is long lasting, approximately lasting a total of 130 hours and charges quickly, and has an estimated life of a 1000 cycles. With a batter designed to be replaced, the Book Light Enhanced is setting itself as a light you'll use for years, one that will help reduce ecological impact. Reading in bed is a favorite pastime for many individuals, though you’ll need to have efficient lighting to be able to read without bothering the person next to you. While older versions of book lights work, they aren't clamped on and adjustable, as well as have stiff necks. Such a design causes you to have to read in awkward positions to get the light to hit the book right. That being said, all the light products we reviewed are great, but the best rechargeable book light is got to be the LuminoLite Book Light because it features a safe-eye reading system, a fast recharging battery, and a lightweight design. What is the Best Light for Reading? What is the Best Color Temperature for Reading? Nocturnal Reader 101: Is LED Light Good for Reading? Some recommended products may use affiliate links. HomeArtsWithDecors.com is a participant in the Amazon Services LLC Associates Program, an affiliate advertising program designed to provide a means for sites to earn advertising fees by advertising and linking to Amazon.com. Amazon and the Amazon logo are trademarks of Amazon.com, Inc or its affiliates. Copyright © 2018 Home Arts With Decors | All Rights Reserved.